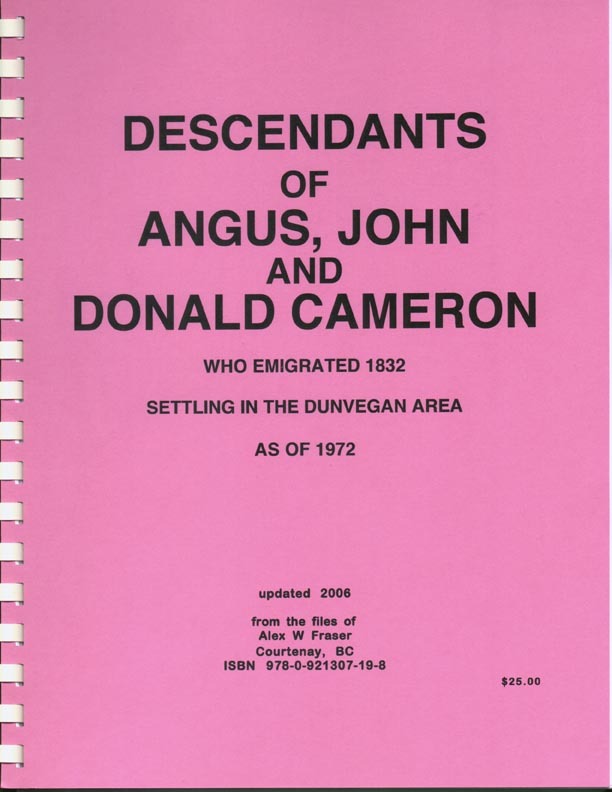 Emigrated 1832, settled in Dunvegan, Ontario area. Original 22 pages done by Gertrude Cameron, Toronto, Ont. 1972. This enlarged update includes a full name index under 9 headings - 14 pages, [surname, christian, birth, death, spouse, parents, location, page, notes] with info on person concerned supplied from original 22 pages of family history; 24 full gravestone inscriptions - 4 pages; Obit/Marriage notices 29 pages; about 3 pages of church marriage records, 13 entries; 10 page outline on another Angus Cameron who also married a McLean, also settling in Dunvegan area in the early 1830's. A 1 page list of A-Z names in the update.